You’ve chosen your venue, the band and DJ are booked, and you’ve even chosen ‘the dress’. So now it’s time for the best bit… choosing your honeymoon! At Woodhall Manor, our wedding planners are always researching the latest trends for all things wedding related, so here’s our round-up of the current hot trends for honeymoons for you to lust over. Your honeymoon is a great opportunity to indulge your joint hobbies so if food’s your thing, why not use this as the inspiration for your honeymoon? For hot weather and equally hot food, we love Asia. As well as powdery white beaches and luxury hotels, you can also get to grips with the local cuisine with a cookery course. 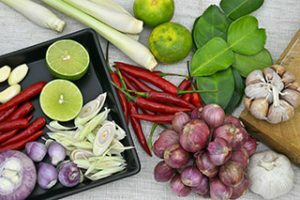 In Thailand, you’ll find many hotels house cookery schools where you can learn how to create Thai delicacies for yourself. If you’re looking for a destination a little closer to home, then head to Italy for pasta and wine appreciation, or to Valencia for paella classes, or what about couscous and flatbread courses in Marrakech? You’re unlikely to go hungry on any of these honeymoons. For a honeymoon with a little more excitement, then there are endless adventurous options to choose from. Learn cattle driving and trail riding on a ranch holiday in Texas, or what about a trekking holiday through the rainforests of Borneo? For the ultimate thrill, little beats the adrenaline rush of white water rafting in Zambia – one that’s definitely not for the faint-hearted! If your idea of adventure involves snow, then there are plenty of luxury ski resorts within Europe where you can enjoy mountain thrills and spills. For all out winter sports glamour, then you won’t go far wrong in the North American resorts of Whistler, Aspen and Lake Tahoe where you’ll also have the opportunity to do some serious celebrity spotting! 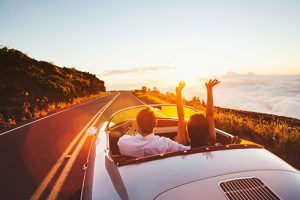 Hit the road for the trip of a lifetime and hire a stunning soft top to make your presence felt! In America, there are endless routes such as the iconic Route 66 from LA to Chicago, and the coastal road from Boston to Cape Cod. Wine lovers will appreciate the San Francisco to Napa Valley trail while music lovers can soak up the soul in New Orleans. Outside America there are plenty of other options for a fly drive honeymoon. South Africa offers winelands, the famous garden route and safaris that are all easily reached by car. Or for something more unusual, what about discovering the fjords and Northern Lights in Iceland? We’ve noticed a growing number of couples who want to explore more far-flung destinations whilst making a minimal impact on the environment. 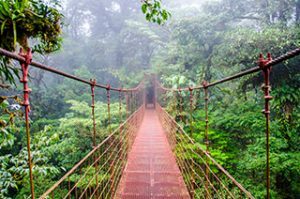 For awesome eco-exploration, head to Costa Rica, Australia and Kenya where you can stay in solar powered lodges, eat locally sourced food and become truly at one with nature without losing any sense of luxury. When it comes to weddings, our talented team have bags of experience and expertise and are dying to share their knowledge with all our couples. To discover the stunning Woodhall Manor for yourself, why not book a private show round? Just give us a call on 01394 411 288 or email info@woodhallmanor.com to book your viewing and we’ll look forward to welcoming you to our stunning venue.